Aurora AR57: based on an original design. Another week and another new analogue synth to tell you about. This one comes courtesy of UK company Synth Restore and is known as the Aurora AR57. Despite having three oscillators and two sub oscillators the manufacturer insists that this is no Minimoog clone. 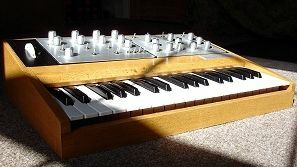 In fact, it isn't inspired by any synth in particular and is said to have an original design. Manufactured in the UK, the Aurora AR57 is available exclusively via Synth Restore priced at £995. At present it's only for sale to UK-based customers but there are plans to ship it to Europe and the US. The synths are built to order - you'll typically have to wait two months and there's a choice of case colours. LFO (tri, sq, saw, random) routable to vco, vcf, pwm. Any mix of LFO waveforms. Modulation wheel routed to LFO depth. 3 octave keyboard, with portamento. Hi freq. LFO rate (ring mod. effects). Germanium transistors in key audio path.